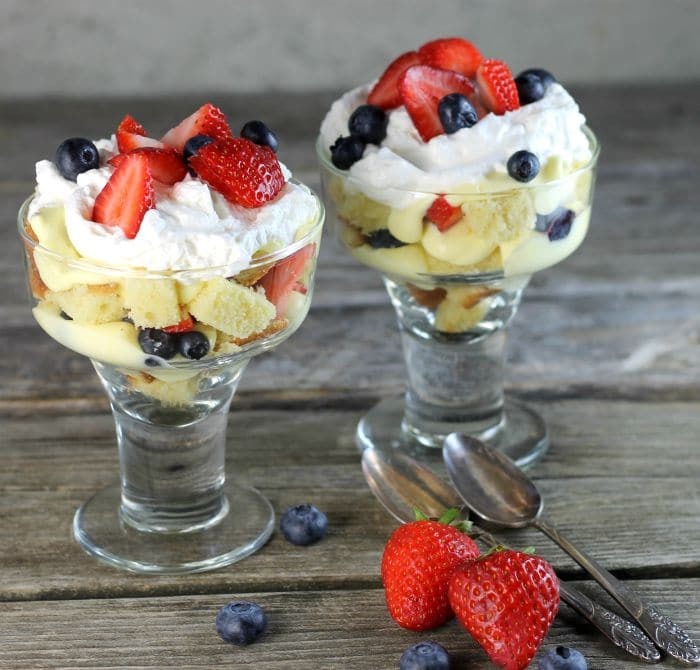 Easy berry trifle is not only a delicious dessert it is also a stunning dessert. It’s one that is sure to impress your family and friends. 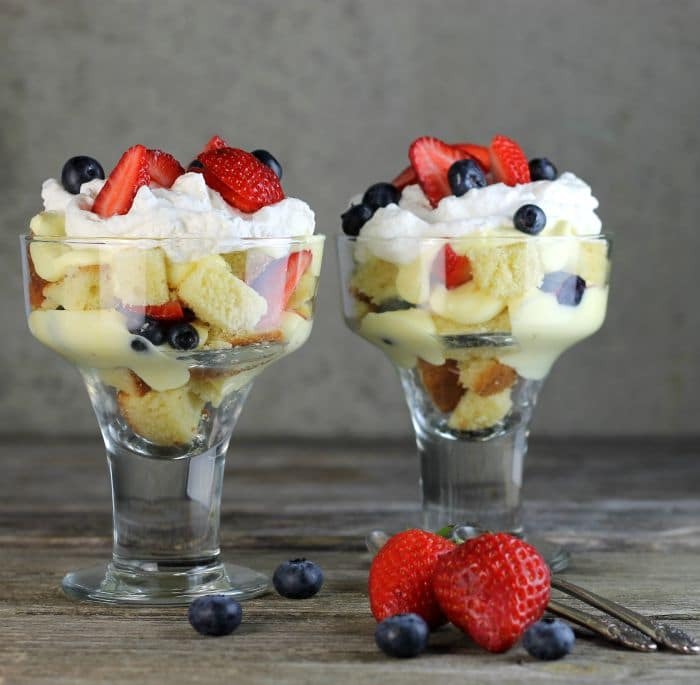 The one nice thing about this trifle dessert is there are no set rules. You can add your favorite berries, cake, and pudding. I decided to make individual trifles, but if you prefer you can make one trifle and put in a trifle bowl. I wanted to show off the new “dessert dishes” that I just purchased. Mike and I have been going to some estate sales this summer. We have gone to a few interesting sales some good and some not so good. The last one that we went to I spied these dessert glasses. I really fell in love with them and knew that I had to buy them even though I really didn’t need them. I love the simplicity of the glasses. They are made for great desserts and I thought the trifle was a fitting dessert for their first use. And let me tell you they were super cheap, that is a good thing. As for this trifle, I made a pound cake, but feel free to purchase a pound cake, angel food cake, or whatever you would like to use. I used blueberries and strawberries because they were in my refrigerator and they needed to be used up before I had to toss them. But also they make a lovely combination. I used boxed pudding and added whipped cream to lighten up. For the top, I used sweetened whipped cream. As you can see I used blueberries and strawberries, but if you prefer other fruits go for it. Easy berry trifle can be made the day before and can be made with store boughten cake, which makes this a winner dessert all the way around. 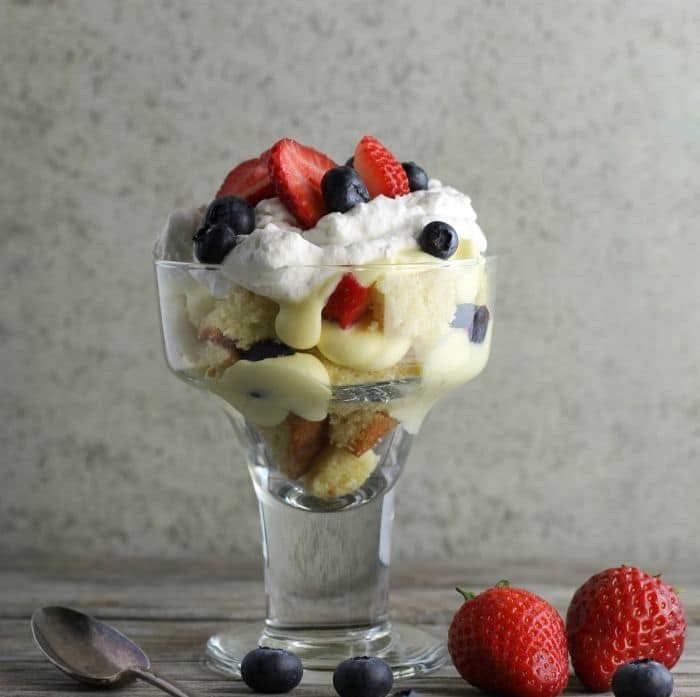 Easy berry trifle a dessert made with cake, pudding, fresh berries and whipped cream simple to make and so delicious. Wash and dry the fruit. Slice the strawberries. In a medium bowl mix the pudding and milk according to the directions on the box. In a large bowl add the 2 cups of whipping cream. Beat with an electric mixer until soft peaks form. Remove 1/2 of the whipping cream and mix in with the pudding. Add the 3 tablespoons of powdered sugar and vanilla to the remaining whipping cream and beat until stiff peaks form. Such a pretty dessert! I love trifle, esp. 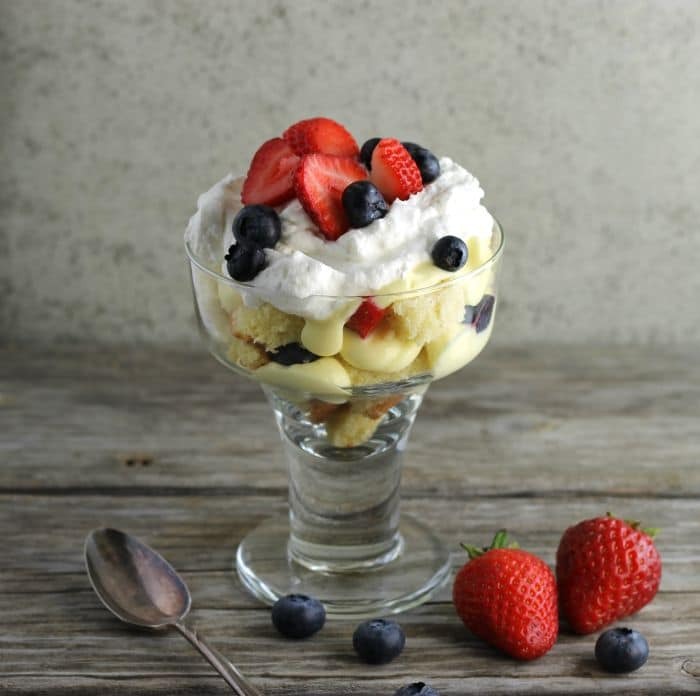 with summery berries! look really delicious Dawn !! I love collecting unique glasses, and estate sales really can be a fun place to find unique stuff. It’s like rolling the dice when you go…you never know what you’re gonna find! This trifle is an excellent use of those new glasses. It looks amazing, and it’s perfect for summer! I love your new glasses! They’re just so much fun. I’m an estate sale lover too. You can find the neatest things! And whoa, is this ever a pretty dessert. Have a great week, Dawn!